As you start your sunrise trek around the 12-kilometre base trail of Uluru you will embrace the culture, geology and environment that is the essence of this amazing monolith. 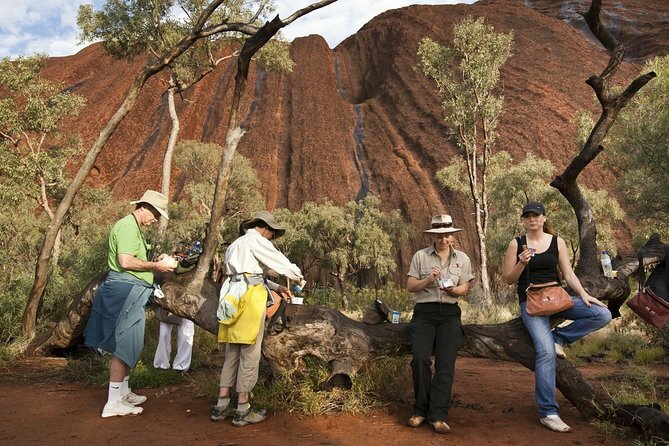 Along the trail you will witness sunrise, visit waterholes and the rock art sites of the ancients and learn of Uluru’s cultural significance to the Anangu (local Aboriginal) people. Take time out to enjoy your picnic outback breakfast as you listen to the variety of desert noises from the surrounding environment. On your journey around the base, your guide will tell you a number of stories associated with prominent Tjukurpa (Dreaming) stories. You will make you way to the entrance of Mutitjulu Waterhole, a semi-permanent watercourse nestled in the contours of Uluru. Here you will learn the Creation stories of Liru (poisonous snake) and Kuniya (python). Philip and Rachel were fabulous. They had so much knowledge and enjoyed sharing it with us. I especially liked that our group was smaller! Peaceful walk at a good pace brisk enough, but with plenty of time for photos, taking in the sights and sounds and listening to stories. We were led by a lovely and well informed guide, and it was a privilege to be in such a magical place. It was a good time of year to do the walk temperature between 8 and 20 degrees, and not too early a start compared to summer. The desert was looking very green, and there were lots of birds around, particularly at the water hole. It was exceptionally good. This was my first tour, after arriving in Uluru and I was thrilled to come away, having learnt so much from our 2 guides, Lachie and Gareth. They were absolutely amazing!!!!!!!! They told us the stories of the Anangu people and how they lived, as we walked along at a leisurely pace and pointed out and named all the types of trees and birds we saw along the way. It was as amazing journey, walking beside The Rock and imaging what it would have been like to live, as these people did, for sooooo many years!!!! Lachie was a font of information and made the walk so informative, I was really thrilled. We sat and had an enjoyable breakfast half way through the walk, over looking the area where you are permitted to climb. I am pleased to say it was closed on this particular day, but some people were still flaunting the rules and attempting to climb a small area. I sincerely look forward to the climb being closed for good!! I can highly recommend this trip, rather than walk the walk by yourself, as you learn soooo much. Thank you again, Lachie and Gareth. Absolutely fabulous way to take in the majesty of this sacred site. Our guide provided an educational commentary on the indigenous Australians and the significance of the site. Las guias fueron muy atentas y simpáticas. Son unos 12km, el camino es fácil aunque con el calor el final se hace un poco más duro. Uluru es impresionante!! Merece la pena hacer el tour! Small group tour with Seit tours. The walk itself is lengthy 12km, but it is flat and easy walking. Just make sure to wear comfortable shoes as you will be walking for about 3.5 to 4 hours. You'll also want to dress in layers as it can be quite chilly before the sun comes up and you will warm up from all the walking. The view of Uluru up close was neat. Our guide stopped at several spots to tell stories or explain the history of the rock. About halfway through the tour we stopped for breakfast and sat in a covered pavilion facing the rock. This was also the only restroom stop along the way, but our guide told us if we really had to go at any point that we could duck behind a bush. Breakfast consisted of cereal, fruit cup, granola bar, Anzac biscuits, and choice of tea, coffee, or hot chocolate. The tour concluded with a final view of the rock and our guide taking pictures of us with it in the background. Overall this was a nice tour, however, we didn't stop to appreciate or take in the sunrise as I thought the tour would. Enjoyed the walk around the base, set at a nice pace and provided with sufficient refreshments for the journey. The Guide was very passionate about the area and was well rehearsed, but suggest a little less preaching in regard to behaviour and respect for Uluru. Allow people to discover its wonders themselves. Enjoyed being in a smaller group.